This week may take the record for the least amount spent on groceries. Somehow I've just been flying through all the backed up items in the fridge. The unfortunate side effect of that is that toward the middle of the week the meals start getting a little uninspired or just plain weird. There were a number of things I could have made tonight. I opted to go with an eastern European theme. A Polish theme, more specifically. Well, it's only one dish so I'm not sure if that can be technically called a theme at all. I don't know anything about eastern European cooking, Polish or otherwise. Nothing. Whenever I try to make anything from any of these countries I always feel like I'm being jerk and insulting many nationalities. Kind of the way tourists from Mexico must feel when they go to a Chili's. Tonight I opted to make Polish Kapusniak for dinner. 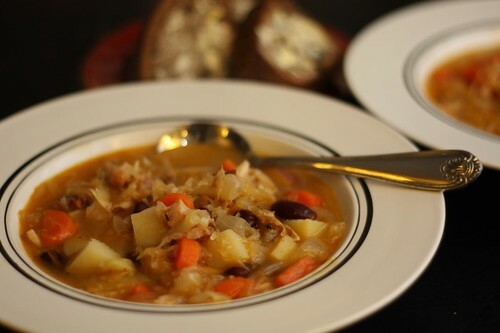 Kapusniak is Polish for sauerkraut soup. The word also reminds me of the oafish friend of Parker Lewis in the classic TV show Parker Lewis Can't Lose. Those are both facts but the latter (I'm pretty sure) is exclusive to this blog! From my research -- upwards of 15 seconds -- I gather that Kapusniak is sort of like a Polish version of bouillabaisse. 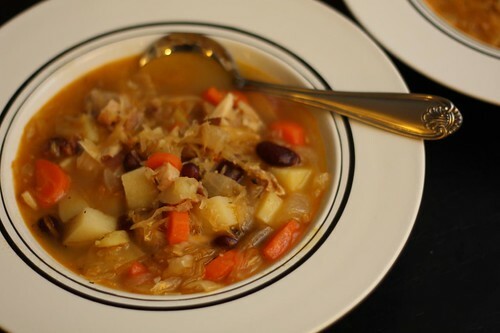 It's loaded with all manner of stewed vegetables, pork items, and sauerkraut. I was careful not to tell Jen what this was until after she'd had some as I was certain that 'sauerkraut soup' would be rejected outright. I browned some crushed garlic in olive oil and butter then threw in the remainder of the tasso from the freezer and some diced bacon. After that had rendered I added spring onion, celery, carrot, and diced Yukon Gold and Red Bliss potatoes, salt, and pepper. Then I threw in the remaining sauerkraut leftover from St. Patrick's Day, a bay leaf, chicken stock, the remaining kidney beans from last night, and water. I also tossed in the remaining roast chicken, bones and all, to stew with everything all together. You can see now why my grocery bill is so low this week. I served the soup with some thick slices of pumpernickel bread and butter. That's something that maybe they might do in Poland. It's possible. If they don't they should give it a try because it's pretty tasty even if the only bakery near you that sells pumpernickel has only loaves with raisins which is a little weird with this soup. I'm not a big fan of having beer with soup but I am a big fan of having beer so that usually wins over. 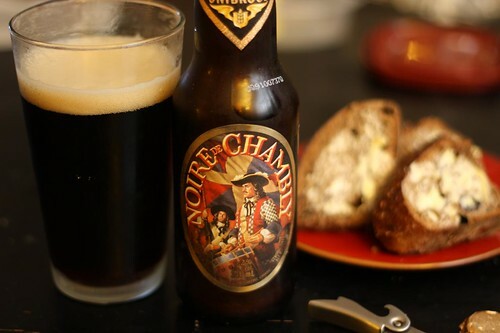 On tonight's menu, another from our Montreal trip: the Noire De Chambly from Unibroue. This beer is named after my ancestors who wore black musketeer hats and fought against the Iroquois on the orders of King Louis XIV. There's nothing quite like drinking a beer to remind you of the shameful actions of your ancestors. Putting aside the beer's namesake I figured that a darker beer might be a welcome accompaniment to a hot soup on a cold, rainy night. It turns out I was right! Not only am I a master of eastern European cuisine but I'm also the world's foremost beer expert. With great fake power comes great fake responsibility.